Automatically download videos, youview in your browser. Save to your hard drive. Add to iTunes. Must have for all web surfers. Fast, easy and uncluttered. Excellent software. Simply the best video downloader I have used. Yes it looks simple, but has a lot under the hood! Fast, reliable, always works and really very simple. The program worked remarkably quickly! I like all the features of this program. Especially the high output quality is amazing, and I believe that you can attract more customers. Fast, efficient, and perfect for getting video downloaded into a format for iTunes in order to transfer to my iPad. Ever wanted to save video to your Mac/iPod/iPhone/iPad? VidBas is just for You! Do it automatically, download original video as you watch it in the browser. Capture any web video automatically: just launch VidBas, start Video Capture and open site like Vimeo, DailyMotion or any other. 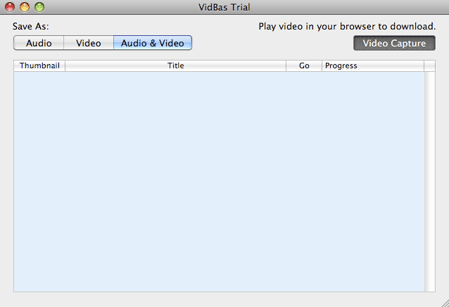 VidBas will catch almost any video you, save and convert it for you to Mac native format (if required). HD and Full HD are no problems for VidBas. No screen recording or ripping. Download original video and original quality! Thats exactly what VidBas does for you! VidBas will automatically save web videos as you browse them and convert them to MP3 on the fly, if you ask it to do so. High quality audio MP3 will allow you to enjoy everywhere! Copy web video to iPhone, iPad, iPod easily!